Gaza civilian casualties: a closer look at the death toll, Israel’s warnings, and human shields. An Israeli air strike on Gaza City, July 11, 2014. 1. The casualty rate. 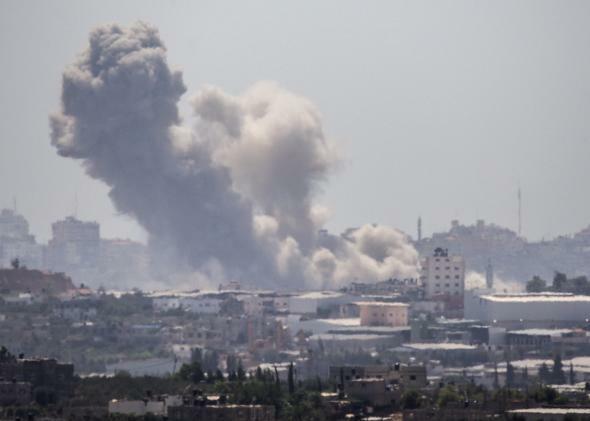 Total deaths in Gaza now exceed 100. Every account except Israel’s says most are civilians. That’s a bad ratio, but it’s skewed by the low number of Hamas military deaths, which can be traced to two factors: Most Hamas officers are lying low (literally—many are underground), and Israel has mostly targeted assets such as rocket launchers, not people. The better measure of Israel’s moral performance, then, is the number of civilian deaths. The latest tallies range from 58 to 75, though the numbers will be higher by the time you read this. 3. Human shields. Israel says Hamas has inflated the civilian death count by telling Gazans to ignore strike warnings and stand in harm’s way. It’s true that some Gazans have done this. There’s photographic evidence of people going onto the roof of a targeted building after a warning. And in the worst mass-fatality incident of the campaign’s first 48 hours, witnesses say that after residents had been warned and had left the house—thereby making the IDF think it was empty—neighbors and some family members went back in to “form a human shield.” By then, the IDF couldn’t stop the missile. Do these factors—the fatality rate, the warnings, the shields—make Israel’s conduct acceptable? I’ll leave that to you. Either way, we need to cut through the propaganda on both sides, analyze the best information on the ground, and put it in context. In some ways, Israel is raising the standards of what can be expected in warfare. Our job is to clarify those standards and hold everybody to them, including Israel.